A fun class project involved designing a magazine cover for an imaginary magazine, including creating the publication and article titles (a tongue-in-cheek nod to all of the dance teachers I've worked with over the years.) Though the project was for an InDesign class, it actually drew heavily on my Photoshop skills when placing the lettering between the little ballerina and the wall. 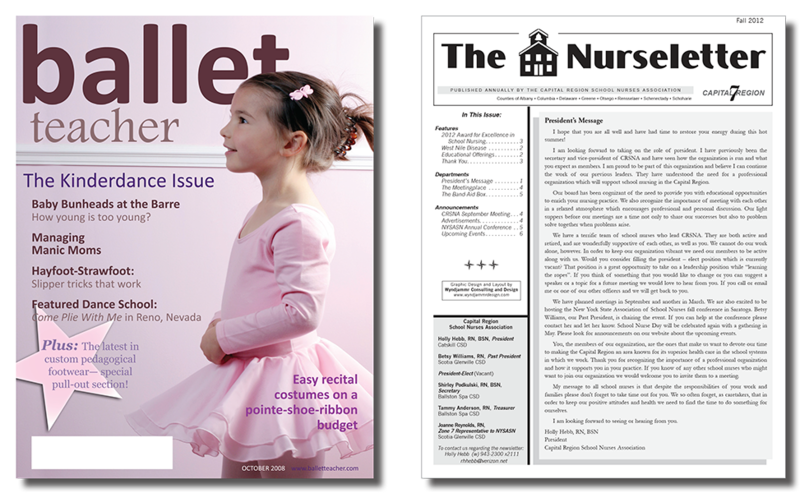 The Capital Region School Nurse Association publishes an annual print newsletter for their membership. The design gives the publication a professional look in a framework that is consistent from year to year.